This is the first book to establish a theoretical framework for commercial management. It argues that managing the contractual and commercial issues of projects – from project inception to completion – is vital in linking operations at the project level and the multiple projects (portfolios/ programmes) level to the corporate core of a company. The book focuses on commercial management within the context of project oriented organisations, for example: aerospace, construction, IT, pharmaceutical and telecommunications – in the private and public sectors. By bringing together contributions from leading researchers and practitioners in commercial management, it presents the state-of-the-art in commercial management covering both current research and best practice. Commercial Management of Projects: defining the discipline covers the external milieu (competition, culture, procurement systems); the corporate milieu (corporate governance, strategy, marketing, trust, outsourcing); the projects milieu (management of uncertainty, conflict management and dispute resolution, performance measurement, value management); and the project milieu (project governance, contract management, bidding, purchasing, logistics and supply, cost value reconciliation). Collectively the chapters constitute a step towards the creation of a body of knowledge and a research agenda for commercial management. Dr David Lowe is Senior Lecturer in Commercial Project Management and leads the Management of Projects Research Group in the School of Mechanical, Aerospace and Civil Engineering at the University of Manchester. He is Programme Director for the highly successful MSc in the Management of Projects, and joint programme director for a distance-learning MSc in Commercial Management, a bespoke programme for a consortium of blue-chip companies. Dr Roine Leiringer is Research Fellow at the School of Construction Management and Engineering, The University of Reading. 1. 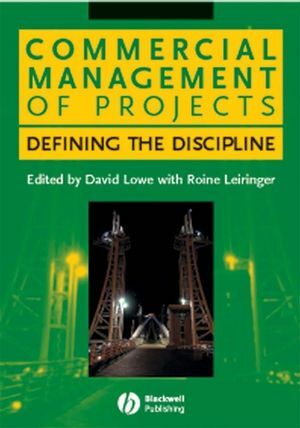 Commercial Management – Defining a Discipline (David Lowe and Roine Leiringer). Introduction to Part 1 (David Lowe and Roine Leiringer). 4. Procurement in the Context of Commercial Management (David Langford and Mike Murray). Introduction to Part 2 (David Lowe and Roine Leiringer). 5. Corporate Governance and Shareholder Value (Marc Goergen and Luc Renneboog). 6. Strategies for Solutions (Andrew Davies and Michael Hobday). 7. The Effectiveness of Marketing Spend (Christopher Preece, Kristen Moodley and Michael Brown). 8. Trust and Commercial Managers: Influences and Impacts (Will Swan, Peter McDermott and Malik Khalfan). Introduction to Part 3 (David Lowe and Roine Leiringer). 10. Management of Uncertainty (Kalle Kähkönen). 11. Conflict Management and Dispute Resolution (Peter Fenn). 12. Performance Measurement (Malcolm Horner). 13. Value Management of Complex Projects (John Kelly). Introduction to Part 4 (David Lowe and Roine Leiringer). 14. The Governance of Project Coalitions - Towards a Research Agenda (Graham M. Winch). 15. Contract Management (Will Hughes). 16. Bidding (David Lowe and Martin Skitmore). 17. Strategic Purchasing and Supply Chain Management in the Project Environment - Theory and Practice (Andrew Cox and Paul Ireland). 18. Signals from site - Embodied Logic and Management Accounting on Construction Projects (Andrew Ross and David Hugill). 19. Afterword - Identifying and Defining a New Inter-Disciplinary Research Agenda for Commercial Management (David Lowe). "A well structured book, and the first of its kind in the discipline of commercial management. I found the usage of multiple contributors very refreshing as they were chosen for their expertise in certain fields."